CLICK HERE to download the April 2019 Carillon Newsletter. Sunday, April 14th at noon, KAUMC Young Adults and Graduate Students are invited to a combined brunch with food provided by chef Lynn Kirch and Tessa Carrel. No need to bring a dish but you are welcome to come and bring a friend. Brunch will be served in the Parlor. Sorting dates in preparation for the sale are April 8, 11, 15,18, 22, 25, and 29. The May sorting date is May 2. Set up for the sale is Sunday, May 5, after Morning Blend and continuing after second service. Work week is May 6 thru 9. Work week hours are 9:30 am to 3 pm daily and evening hours are 6 pm to 8 pm. Pride SIGN-o de Mayo will happen on May 5 in the Parlor following the 11:00 traditional service. We’ll be making new signs for the Pride parade (June 15) and enjoying some yummy tacos. There’s a sign-up on Realm, so if you plan to attend the sign-making fun, please let us know! Mark your calendars for the upcoming February and March events for King Avenue Children, Youth, and Family Ministries. READ MORE. In response to the United Methodist Church Special Session of the General Conference and the passage of the Traditionalist Plan, we will be actively supporting our LGBTQIA+ and studying a future that honors, nurtures, and includes ALL. King Avenue will remain a welcoming, reconciling, and serving church which shares God's love with ALL! 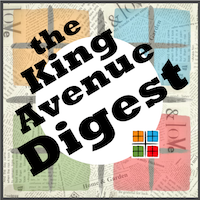 King Avenue Church will not change what it is and what it stands for. Although we are passing through a dark storm in our denomination, there is hope – within the United Methodist Church with necessary progress made towards full inclusion, or even in a rebirth of a new Methodist denomination.